Tron.Live had an interview session with Game.com CEO — Xu Le. We talked a lot about blockchain and how the future of blockchain gaming will be. We also discussed Tron Network (Tron Labs) in depth and talked about Justin Sun— the founder and CEO of Tron. TronLive: Hello Xu Le, although we already know each other, can you give us a brief introduction of yourself, so that our readers can have a better understanding of you? My name is Xu Le, an entrepreneur from China. I started entrepreneur activities since I joined Tsinghua University in year 2000. I paused my studies in ’02 so I can stay focus on my entrepreneur journey. So, this is my 18th years in entrepreneurship, with 10 years in Internet business and 8 years in gaming industry. One of my most memorable event is during 2012–2014 which I led my development team and move towards the global mobile gaming field. We made it to the Top 5 in casino gaming field worldwide. We are known as “TOPGAME” that time and I believed a lot of Australia, US, UK and Canada mobile gamers have played the game we made before, it’s called Titan Slots. In fact, during these years, I have also invested in around 30–40 companies. An example is a company called verlocal.com which is based in San Francisco, US that empower local experts to offer activities, classes, events, services, workshops, and handmade products on a single platform. We also made friends with a lot of partners along the way, this also includes our good friends’ companies and companies in the gaming field that we came across during those years. This eventually resulted in long mutually beneficial business relationship. So, the business we are practising is on a global level, not focused or limited to any specific countries at all. TronLive: Your company and the projects you invested in sounds interesting! I’m sure a lot of people would like to get to know about you and learn what you have in store for us. Since the beginning of this year, TronLive has been collecting unanswered questions and doubts from users on numerous online communities, forums and chat rooms. The user base includes TronLive supporters, tweeters, discord players, Tron and Game.com supporters as well as one of the fastest growing cryptocurrency community — Tronix subreddit, which has over 53,000 members and growing. TronLive has also collaborated with Tronix subreddit mods and compiled some questions that may be extremely useful for the community members. We hope you can clear these questions for us, so more people will get to know Tron and Game.com better. Do you want to have a word with your supporters before we move on? First of all, I am really thankful, grateful, and appreciate all of this, and I am really happy that we all get along well in this new era. A futuristic era of cryptocurrencies and we are all early explorers of this new world. There are many talented individuals in this field who are brave to march, strive and work to achieve all of these. We can look back at our first generation cryptocurrency like bitcoin, or later generations of cryptocurrencies like Ethereum, EOS or Tron. These are all great in itself. However, I think that this new world still lacks content and entertainment. This is the reason why we bring in game.com so that we can provide gaming and entertainment services to everyone, and add vitality to this field. More interesting content and activities will be introduced in the blockchain field. TronLive: Blockchain is indeed a whole new world. Let’s talk a bit about blockchain. What’s your personal opinion on blockchain technology? TronLive: You are right. A good business model with the addition of blockchain, will speed up the breakout growth. Conversely, company without the right business model may eventually be eliminated. I think a lot of people have various interpretations of blockchain. Actually, blockchain is just a technology, a technology concept that enable decentralization, shared ledger, to be collision-resistant, etc. This is just like when the Internet Official Protocol Standards are defined in 1997, 1998. I think the most important part in this is how we can utilize the technology to achieve better things, build greater platform and offer more creative services. The actual meaning of blockchain game isn’t clearly defined yet. The popular Ethereum’s cryptokitties is not the blockchain game that I had in mind. In my opinion, it is just a game that makes transaction over blockchain. Game.com is currently working hard so that by the end of this year, we will show the world what blockchain gaming should really be like. Let’s be straightforward here, the underlying system for cryptocurrencies like Ethereum or EOS is far from reaching the performance and efficiency that we hope for in the gaming field. A simple game like cryptokitties can already slow down the entire Ethereum network, let alone more complex games that we may see in the future. Don’t get me wrong, these systems are actually great for what they are designed for — smart contracts and other commercial use. If you ask me what blockchain gaming should be, I think the most basic idea is of course it will have some sort of integration with cryptocurrencies. However, the essence of blockchain gaming is you will have to use blockchain innovative ideas to redesign a game completely, to redefine how a game should be, and let people who uses blockchain to actually fall in love with the game. TronLive: How do you plan on bringing gaming into this whole new world? There are a couple of important points we will focus on to bring gaming into the blockchain world. First of all, we will have a strong development team that will introduce games with blockchain concept so everyone will have a good gaming experience. So, we will design these games by ourselves to meet the standard. Secondly, we will offer these games to our of partners like TRON, QTUM, ACT, and many more partners that are already in queue. We will help all of our partners to deploy their cryptocurrencies on our entertainment platform. The third point, in the mid of February, we will open up our global GTC platform that allows any potential gaming partners around the world to join. They will be able to integrate their games with our platform and so people can use GTC to purchase and play their games. Of course, game.com gaming platform will also help partners like Tron, QTUM and Achain to deploy their own open gaming platform. Our goal is to bring entertainment to the world. In the near future, we will also introduce our crowdfunding for gaming field. You can think of it as Indiegogo or Kickstarter, but the biggest difference is our platform will only accept cryptocurrencies. The other notable difference is on a traditional crowdfunding system, a project with good potential will be fully funded in a short period of time. Newcomers who wished to fund the project couldn’t join anymore, and people who are funding the project may need to wait for a long time before the project actually kicks off. We will use blockchain innovations to redefine the next generation crowdfunding platform. For example, let’s say you are already funding a good gaming project, you can actually assign this funding ownership to others with greater interest, so that you will get your investment back quicker. We will use this crowdfunding platform to help more game developers or team, by giving them power and support to create a better game. The end result of all of these is we will see more exciting games being developed and better gaming experience for everyone. And of course, we reached the fifth point. On 29th March this year, game.com will release the World’s first ever Instant Messaging (IM) for blockchain mobile gamers worldwide. Chatting is just the basic, it is actually a complete integration of blockchain gaming and IM that allows gamers to have more fun and smoother game experience. You will be able to communicate and chat with other players, or chat within your game guild. You will also be able to trade pets, trade items, gift GTC or even other cryptocurrencies in the future, right within the Instant Messaging app. Gamers around the world will also have a common unique Game.com ID that they can use to access and play any blockchain games on our platform easily. TronLive: Thanks for your detailed answers. Looks like Game.com already has its future well planned out, this sure is an exciting beginning that we can anticipate. We spotted several interested individuals wanting to be a part of Game.com already. Are you still looking for talents? Yes, we are looking for talents. I posted an announcement few days ago that we are looking for developers, global game business development officer, global game business investment officer, global PR marketing officer and Product director. 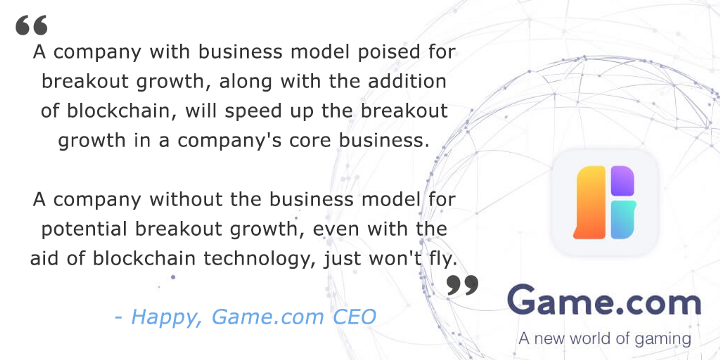 We strive to expand game.com to a global scale and serve gamers worldwide. Therefore, we do need more talents to join us and achieve this dream — to bring happiness to the world, using games to change the world, as well as to foster the development of blockchain. TronLive: What about gaming partners, how can they reach you? They can find relevant contact info on our official website. Gaming partnership can come in different level. A gaming company may choose to integrate their existing games into our GTC platform or not to join the platform at all but choose to accept GTC as a payment option for their in-game currencies. A traditional gaming company takes fiat as in-game currency that will be devalued over time. If a gaming company accept GTC as payment option, with the value of GTC rising over time, this will be a different story. TronLive: This sounds good. I believed in the near future, you will receive a lot of collaboration with various companies and partnerships with more cryptocurrency partners like Tron as time goes by. Since most of our readers are Tron’s supporters, I’m sure they are eager to know your opinion on Tron. So, what’s your view on Tron? Well, this is a really interesting question. Sometimes, when you are new to certain things that you do not have much understanding on, it’s hard to see where things are going. There’s a saying that goes like “the fear of the unknown is worse than anything”. Actually, back in the days when Justin introduced Tron in China, I’ve actually seen his whitepaper. That time, I’m quite ignorant and thinking that isn’t this just imagining things out of thin air? I couldn’t see how these pieces will come together. Well, that is just my personal opinion back then. TronLive: Aha, so this is your first impression of Justin. However, after China banned initial coin offerings (ICO) and bitcoin exchanges on 4th of September last year, an ordinary person just won’t know the pressure that Justin has gone through. Despite this, Justin was able to revitalize Tron in global market and in such a large scale, getting Tronix listed on so many exchanges, doing a lot of PR, and so on. So, no matter how Tron will perform in the future, what we are seeing today is how determined a person can be and how one is able to cope with such a tremendous pressure and does it well. TronLive: Can you let us know some more of your personal opinion on Justin Sun? When a person is able to scale something from scratch to a global large scale, we can gauge one’s ability from this. Tron went from a market cap of $2 billion to an all time high of $16 billion market cap after partnering with us, of course with their own hard work as well, this shows the potential that one has. Despite that the current market is not so well which range around $3–4 billion, this is not all that important, it’s just a process. What we should focus on is this young man’s determination, endurance, and execution of tasks under pressure. When one already has market in such a global scale, along with a powerful and talented team panel with great dreams, shouldn’t we think that they have greater chance to succeed compared to others? So, I do think Justin’s future is bright and he will do well long term. And of course, because of our partnership, we will also do what we can to position them better. All these are good indications. Furthermore, each integration and partnership with the GTC gaming platform is a million dollar contract and the games developed will be distributed to our partners. So, we will provide Tron and other partners a great platform with lots of gaming and entertainment services. The contracts are settled with cryptocurrencies like Tronix, Qtum, Achain and so on. So, what we are betting is the future of these cryptocurrencies. We think that Tronix will worth more in the future hence the earnings we make can be greater. So, you can see that this is a new ecosystem that is mutually beneficial for both parties. TronLive: Actually right now, there are still a number of people which think that Justin will not make it. I believed, time will prove everything so let us see how Tron will evolve as the time comes. Yes, let me clarify this. It’s just that I’m am ignorant during that time because we may be lost in a world that we are not so familiar with. However, when you take the time and fully understand how things work, you will see that it is not an easy process. The person who made it to the top is truly an astounding person, which normally has more ability to achieve better things. Entrepreneur is indeed really hard and many may end this journey halfway. We do really need time to see how everything will turn out and see who has the determination to made it to the end. While we are at this, I want to introduce the audience to a company called Cobinhood. The owner of this company is a genius. Cobinhood is not only the first cryptocurrency exchange company that offers 0% trading fee, it also offers great incentive for its COB token holders. Every month, Cobinhood will have an ICO underwriting project that is worth over a hundred million, and they will take a huge portion of the 5% they get and distribute it to its token holders. What we are seeing with this company is how they uses blockchain concepts and ideas to redefine a new ecosystem. In their view, many so-called next generation cryptocurrencies still do not truly stand out because they positioned themselves inside a box. So, I hope that many cryptocurrencies that we will see in near future can have better performance, be more efficient, and offer 0% transaction fee. This will be an standard that we all can anticipate. TronLive: Regarding COB, I have came across it before. To be honest, my first reaction on this system is more or less like your first impression on Justin — somewhat disbelief. How can a trading platform of 0% fees sustain itself. After looking into its’ whitepaper, I have to say that blockchain can be truly innovative. We will provide the link at the end of this interview so readers who wish to learn more about COB can refer to it. Anyway, let’s get back to our main topic — tron.game.com. Because the game is still in beta stage, some people think that it is just another cryptokitties game. Can you tell us what differences does tron.game.com have? I think since a lot of players that are used to cryptokitties see Pet Planet as just another similar game or even a clone of the game. This is truly not the case. If you take time to actually experience Pet Planet when more features are up, you will see that our game is on a whole new level. You can even say that there’s not a single similarity across these games. Cryptokitties is based on cat, and Pet Planet started with dogs. Can’t we have cats on Pet Planet, or even other animals? There’s a reason why we named this Pet Planet. We just borrowed the idea from cryptokitties which gives us some inspiration. However, the underlying mechanism of Pet Planet and how it will be played out is entirely different. TronLive: Where is Pet Planet heading in the future? Pet Planet will become a massive virtual world. We actually already had this well planned from the start. Raising pet is not the only thing you can do with this game. If you really want to know my opinion on cryptokitties, I am thankful that this game enlightened me start Pet Planet. The founder of cryptokitties has great ideas, I like their whitepaper, and the team have good knowledge of the industry and blockchain. However, I think the fate of cryptokitties is it will fail in the end. Let’s say I just bought a Generation 0 kitty for 3ETH, not long later, the official store started offering a Generation 0 kitty for just 1ETH. This kind of high frequency wholesale practice already determined the game’s fate. This excitement you are seeing in the game is solely based on speculative earnings — buying low and selling high. TronLive: Thank you for your answers. I’m sure this will clear a lot of doubts people have on Pet Planet. So, right now, purchasing a pet with TRX will yield a random amount of GTC bonus. Can you tell us more about GTC and its platform? When the GTC platform is ready, there will be all sorts of possibilities. This won’t just be a gaming platform in the future, anything can be integrated into GTC platform. For example, on GTC crowdfunding, people who holds GTC will get part of the ICO tokens that are raised through our platform, we actually learned this from COB. So, with consumer’s demand and continuous benefits for token holder, what will GTC value be in the end you may ask? This will be equivalent to our cumulative consumption volume each year, along with the expected price-to-earning (P/E) ratio that the market values. TronLive: Great to hear information that are not found anywhere yet, thanks for sharing it with us. Let’s have a look at my list and see what other questions are left. All right, here’s one. Will we see TRON exclusive games in the future? Of course, we may consider offering exclusive games for our gaming partners in the future. However, I think this is not as important. I think having an early preview/release of game on a platform is better because you get to experience the game first. In my opinion, the World may be better if less things can be “exclusive”, so the fun can be “shared” to greater audience. TronLive: Are you planning on going open-source like Tron Foundation? GTC is actually open-source since the first day it was released. You can actually find the smart contracts and other info you need on our github. I think some people may have a misunderstanding of what game.com is. We are actually a company that develop games and provide a platform for other gaming partners to integrate with GTC. Therefore, the games themselves can’t be open-source because these are our products and Intellectual Property Rights. TronLive: Could you give us a small sneak peak of the next game? The next game will be introduced within Pet Planet. As I have mentioned before, the pet is just a starting point. Pet Planet will actually be an entire virtual world itself where you can play many, many different games within it. If you are referring to games other than Pet Planet, these will be our partnership games like pool, basketball game, billiards, and much more interesting games that are already in discussion. TronLive: Have you thought about game release for a console? GTC can be thought of as virtual currency or a payment method for the game itself. Gaming companies can actually integrate their games into out GTC platform to collect payment or use it as in-game currency. To go on further, I envisioned that someday in the future, you will be able to use cryptocurrency to buy coffee in a store or use it on any other stores or services that accept these in real life. Cryptocurrency will be closely tied into our lives, so close that it actually will become a part of our lives. So, there are a lot of possibilities, anything is possible. TronLive: Where can we stay up-to-date with game.com and the whole development process? We will be announcing our news and updates on our official site. We will also release these news to social media channels that we use regularly, for example Twitter. Of course, we are developing the official news announcement platform on the official website and you will be able to see all of our latest events and announcements on there soon. TronLive: Lastly, let’s talk about the English and Korean version of Pet Planet Tron game that will be release on January 22. I’ve got a question here that seems to be amongst the top concerns of Westerners who already started playing the Chinese version. When the English and Korean version is out, are the data synchronized? In another words, do all different language versions of gamers get to play, trade, buy and sell dogs together, on a single platform? This will be a global service. One common version for one game, with multi-languages support. So, people from all around the world can play together. TronLive: Well, that’s a relieve to know for many gamers. So, is this more or less how game.com development process will be? That is, the Chinese version will be released first then followed by other languages, or do you have plans to do simultaneous releases in the future? Our future games will have simultaneous releases across all languages when game.com is mature enough. The reason we released the Chinese version first on our first game is we want to survey the market, tweak and make adjustments, test and debug to perfect the experience, in the market that we are familiar with. We have already fixed a lot of bugs by now so the other players will get to play the game at a more stable stage, with added features. In the future, you will see updates and features being added across all languages of the game at the same time. 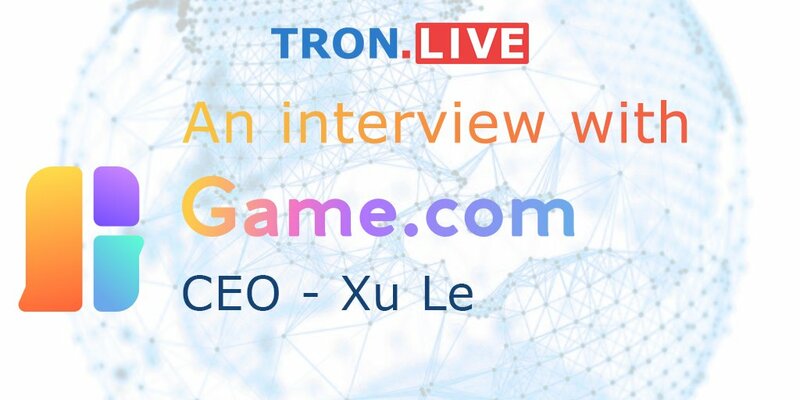 TronLive: Xu Le, thanks a lot for your valuable time to have this interview session with Tron.Live, and cleared many questions for our readers. I believed with these insights, readers will get to know more about Tron and Justin, and know more about you, along with the product and services that your company has to offer. What we are seeing is not just a new game, we are seeing a new concept, working together towards creating a new gaming world. Thank you once again and let us work together to achieve this dream.